Madalina Frantiu is the daughter of an important personality in her city and county in Romania. She got used from an early age with continuously ringing phones (and recently cell phones) asking for Dad. "Yes, you_do_disturb!! We were about to leave to our house on the countryside!" 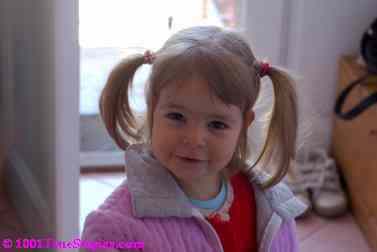 Now, maybe you have noticed: Madalina’s last name is Frantiu, and she was sometimes asked, like in this story here, whether it was Frentiu family. Frentiu is the basic family name where from the very unusual Frantiu version has been derived. Much to Madalina’s chagrin, not all people notice the small difference in pronunciation, which in Romanian is however more obvious than in English. She knew she was a full-blood Frantiu, hence people calling them should also know it. ... Without further fuss hanging up the phone after that. An adult would have understand the „subtitle” of the question: when does Dad come back? A child is not supposed to be good in approximating time, so the adult aimed at overtaking this computing work. "Haven’t you got it? He’s_NOT_at_home!!" And bang!, phone again hung up.